Do you ever feel like you are “in the trenches”? In the trenches of raising littles ones, in the trenches of working full time, trenches of singleness, marriage, or a long term relationship? There are trenches of all sorts…..caring for elderly parents, caring for infants, raising teenagers, grief, even empty nester trenches. 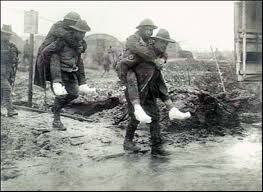 When we see someone in a trench with us, we should come up alongside and encourage them. So often our human instinct is to judge, compare, criticize, and question. Where’s the love in that? Open your heart and eyes to others and help them if you can. Encourage when you can. Sympathize, empathize, and love. If you can’t do any of these, don’t intentionally harm them. Correction can be a form of love, but to quote John Maxwell “People don’t care how much you know until they know how much you care.” TRUTH! They will know us by the way we love. The next time you see someone in a trench with you or one you’ve been in before, give them a smile, a compliment, or at least an understanding head nod to let them know that you can relate to what they are dealing with. Offer them a push and a prayer because we all get stuck now and then. The trenches of life are seasons. Some seasons last longer than others, let’s help each other get to the other side.